Each year, the CDC recognizes World TB Day on March 24. This annual event commemorates the date in 1882 when Dr. Robert Koch announced his discovery of Mycobacterium tuberculosis, the bacillus that causes tuberculosis (TB). World TB Day is a day to educate the public about the impact of TB around the world. It is a day to share successes in TB prevention and control, and raise awareness of the challenges that hinder our progress toward the elimination of this devastating disease. Staff from the TB Control Program hosted a polycom on Friday March 22nd from 12-2pm in lieu of World TB Day. This year, our focus was on Contact Investigation. 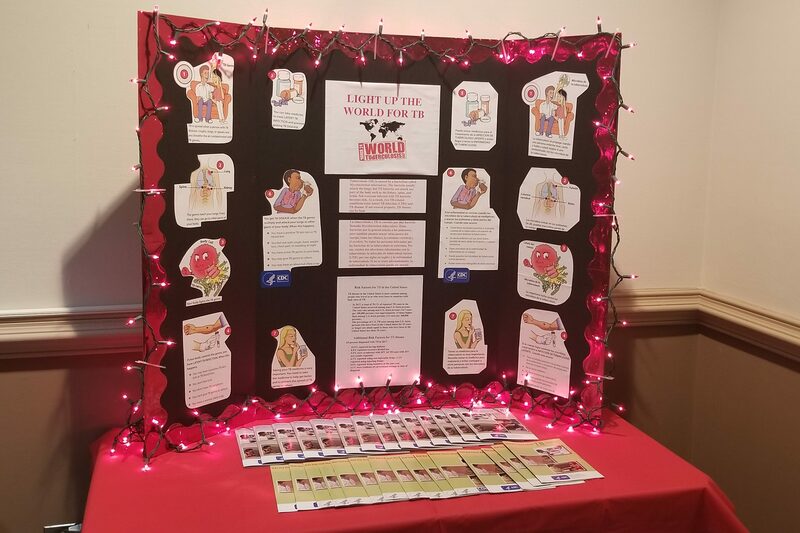 Petersburg Health Department, Crater Health District, is helping to spread the word of TB & LTBI for World TB Day with this exciting information-board. 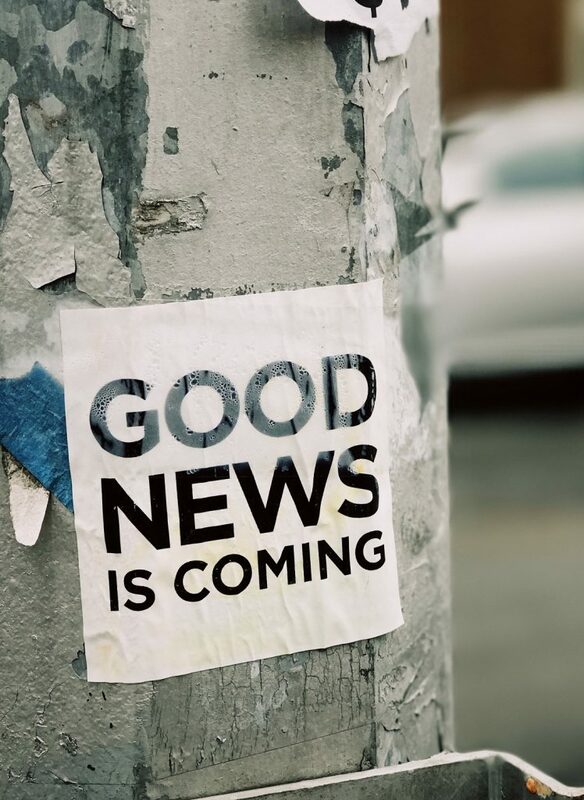 Raising awareness is a crucial factor in the work towards elimination, so taking advantage of opportunities like this is a great way to inform and fight back against TB & LTBI! Way to go Connie Dennis-Booker and Crater Health District! Waynesboro Health Department nurses were featured on the Center for Disease Control's facebook page. 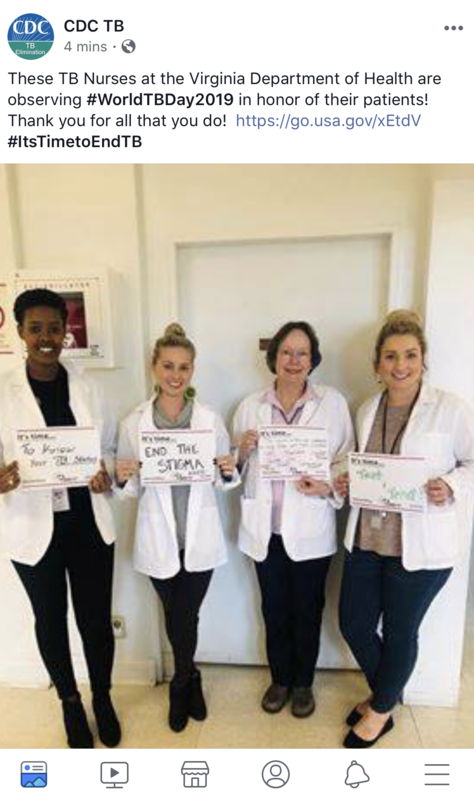 The team consists of: (From left to right) Sonia Gwaneza, Community Outreach Worker; Aubree Moore, RN, Supervisor; Sharon O'Dell, RN, Public Health Nurse; and Tylar Marcum, RN, Public Health Nurse. Thank you ladies for fighting to end the stigma around TB! World TB Day is March 24th. There will be a polycom to celebrate World TB Day on Friday, March 22nd from 12-2PM. March 29 - New TB Nurse Training in Hanover, VA. Registration closed. April 18-19 - Outreach Worker Training in Henrico, VA. Registration open here. The US Preventive Service Task force published Latent Tuberculosis Infection Recommendations encouraging providers to test for latent tuberculosis infection (TBI) in populations at increased risk. This recommendation will increase efforts to find and treat people who have TB infection, and is an important step forward in our national strategy for eliminating TB. The TB Program is recruiting for a part time nurse consultant in a wage position. Please keep your eyes open for the recruitment and consider joining our team, or at least spreading the word about the position. Tuberculosis Infection (LTBI) became reportable on November 14th in support of our goal of TB elimination. Please see the TB Infection page of our website for more information. The submission process for contact investigations has been updated. The revised instructions for submission and updated forms can be found on our website on the Forms for Local Health Departments page. This change has been made to help alleviate the burden of reporting this information at three time intervals. There is a job opening in our unit for the head of TB and Newcomer Health. This will be the TB Controller position for the state. Please pass the word and visit the job posting. A New TB Nurse Training on December 11 in Hanover, Virginia. This is a training for nurses who are new to TB (not necessarily new to nursing) and have been working in TB for less than 1 year. Nurses who have attended this training in the past are NOT eligible to attend again as space is limited. Nurses must complete the pre-requisite of the CDC Core Curriculum on Tuberculosis - found here. It is estimated to take around 6 and 1/2 hours to complete this curriculum. Health Districts will need to cover travel expenses. Lunch will be provided. Registration for this training is closed as the course is full. The TB and Newcomer Health Program is focusing on the examination of TB classified individuals as part of program evaluation efforts. A presentation on this was given at the Annual TB and Refugee Nurse Training and the archived presentation can be found on our website on the Training page. Each health district has received a district level report with their performance. We would encourage you to reflect on the performance and brainstorm/discuss with your teams about your successes and challenges.